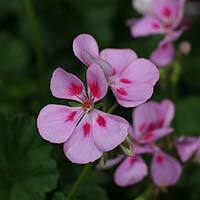 Geraniums are one of the most popular flowering garden plants available for sale. Many nurseries will carry a few varieties all year round, however if you are looking for some of the species, or perhaps something a little different, try an online nursery. Scented geraniums are very popular and are grown for both the flowers and fragrance. 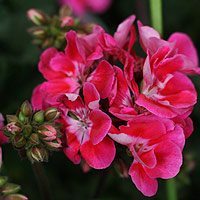 Geranium care is not difficult with he main tasks being being pruning, deadheading and repotting all being very simple and light work. With a huge variety available, geraniums come in species as well as varieties such as: , zonals, five fingered, miniatures, regals. Pelargoniums are a little more tender than geraniums, but more colorful. So those called Zonal geraniums, Scented geraniums, Regal geraniums and Ivy leafed geraniums are actually Pelargoniums – all have their merits. Start with plant selection, plants that are tall and straggly are out, look for well formed strong plants. Geraniums prefer full sun and a humus rich well drained moist soil. Geraniums do well if grown in pots or containers. They can be pruned back in winter when growth becomes slower and the plants look untidy. Many gardeners cut back by 1/3 to 1/2. Rust and leaf spot are the major diseases but are easily controlled. As autumn comes around its time to prune most geraniums. Simply prune back to make a bushy shape for the next season. You can use the offcuts as cuttings. Geraniums are fairly easy to strike from cuttings. Try using tip cuttings at around 10cm, take a section of stem about 10cm long, remove lower foliage and let the cutting cure for 12 -24 hours (helps prevent rot). Use a light free draining potting mix (dip the lower part of the cutting in some some rooting hormone powder if you wish) place in a pot and build a little hot house or igloo with a plastic bag to help retain humidity. Remember to label with a pot tag.